Welcome to SmiShri's Carpe Diem Spicy Eats! Experience the quick and easy way to spice up your life with delicious Indian Vegetarian Cooking ...Simply Enjoy Maadi!! Kaman Dhokla is an interesting traditional Gujarati snack recipe. Easy to prepare. It is soft and spongy and tangy. It is a blend of yogurt and besan/gram flour with spices which steamed to form fluffy dhokla. Enjoy with chutney. Method - In a bowl, mix besan,rava, Salt, Turmeric Powder, hing, oil with curds. Then add water to mix well and form a batter. Add lemon juice and green chilli paste. Mix well and leave for 10 mins. Next at baking soda and stir quickly. Add the batter to a greased pan and steam in pressure cooker for 15 mins. Check if done, less leave for 2-3 mins more. Let it cool, slowly remove the dhokla form the pan and cut into desired shape. Add the sugar water and lemon juice over the dhoklas. Prepare the seasoning. Heat oil in the pan, add the ingredients mentioned above under seasoning. Once done add this over the dhoklas evenly. Garnish with chopped Coriander Leaves. Enjoy the Dhoklas with chutney or just like that. Thanks for stopping by, Do check other exciting breakfast recipes for your weekend. Moist Orange Cake slice - I am trying my hand at baking, this is my first one. Do try it out, easy and delicious, especially when it is the season for juicy colorful oranges. Its fresh and has a nice tangy taste. Kids will love it too. So for a perfect tea time or for your kids lunch box, check this moist orange cake. Method - Preheat the oven to 180ºc ,prepare the baking tray by lining with parchment paper. Next sieve the flour, baking powder, baking soda well. In a bowl, mix sugar and curds and blend well. Next add orange juice, zest, oil and blend again. Once it is mixed well, add the flour mix slowly and fold in carefully. Do not over mix. Add the batter to baking tray. Bake it for 30-40 mins. You can insert a toothpick, to check if the cake is done well. Once done, let it cool , slice and serve, Enjoy yummy and delicious orange cake. Don't forget to check other interesting kids lunch box recipes from : Corn under Ingredients Search. Gongura chutney is an interesting accompaniment for rasam rice or Indian breads, healthy and tangy. A must try out! It is called Red sorrel in English or Ambadi in Marathi. It is sour to taste and loaded with Vitamin C! Method - In a kadai, dry roast menthya/fenugreek and grind it to powder. Heat oil add chilies,turmeric,hing, gongura leaves and fry well. Let it cool. Grind it into fine paste,add salt while grinding. Next prepare seasoning-heat oil in a kadai,add mustard seeds, once done, add the paste and fry till 10 minutes. Add menthya powder and mix. Enjoy with Akki rotti, chapati or rice. Don't forget to check other varieties of Chutnies you can enjoy with Dosa,Idlis or Akki Rottis. Method - In a pan fry Cumin Seeds, Dried Red Chillies, Coriander Seeds and Fennel Seeds (Saunf) on low heat till they become slightly dark and fragrant.Grind it to a coarse powder.Next in a big kadai, add oil and add finely chopped onions and fry it.Add ginger garlic paste. Next add tomato puree to the pan and cook. Next add the masala powders. Next add capsicum to the gravy. Add 1 Cup water to the gravy and cook for a few minutes, add salt and sugar.Mix well. Once it blends well add the Paneer cubes. Cover the pan with a lid and cook till the Paneer is cooked, top it with cream, garnish with corinder leaves and serve it hot with any Indian Bread like Naan, paratha or simple chapathis. Don't forget to check other interesting recipes from : Corn under Ingredients Search. 'Accept responsibility for your life.Know that it is you who will get you where you want to,no one else' Les Brown. Healthy Burger is a simple and easy recipe and am sure you all will love to make and enjoy it with your kids. Get their help to assemble the burger and it will a happy family time ! Healthy Burger has a mix of vegetables and aloo patties with cheese a perfect heavy meal. Cheese is for kids though, elders can skip it or enjoy and go for a run! Method- Prepare the patties and keep it aside. Cut the burger bun in half and lightly roast the burger bun with little butter. Apply the sauce on both sides. If you like it spicy apply green chutney. Next start assembling the burger-keep the patties, place tomato, cucumber and onion slices, cheese slice over this, cover it with bun and press lightly. Enjoy. ‘Amla or Nellikayi as we all know is said to be a super fruit loaded with nutrients. It is immensely beneficial for our health, hair, and skin. It helps to build immunity and delays aging. You can make various recipes using Amla. Here is Amla Murubba. A perfect dish for your kids to enjoy with chapati. Enjoy this khatta Meeta yummy and deliciously sweet Amla recipe. Method- Wash the amlas and grated it finely, discarding the seeds. Meanwhile dissolve sugar in water and make syrup. Keep it on low flame, stir in between. Add the grated amlas in this solution. Let it cook till the mix becomes thick.Add cardamom powder and saffron. Once cool, store it in glass jar. Enjoy Amla Murubba with parathas rotis or bread. 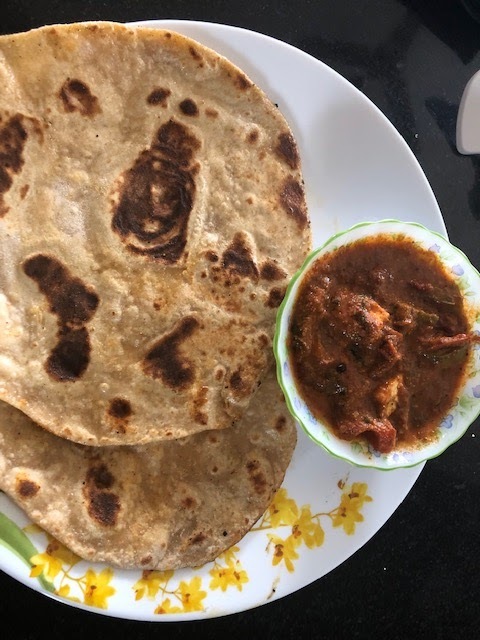 Please do check other interesting "Parathas " that can be prepared and enjoyed at home under Menu Planner. Potato Smileys is simple and easy recipe that can be prepared in less time. Your kids will love your for this. Method - In a bowl, add mashed potatoes, add bread crumbs, flour, pepper pwd, chili pwd, salt and mix well. Rest it for 30-45 minutes in fridge. Take a big ball size and make thick paratha, using cookie cutter, make round shape, make shapes of eyes and mouth (use spoon or straw to make shape) and take it on a separate plate.Repeat for the entire dough. Heat oil in kadai. Fry well till it is golden brown on both sides. Enjoy hot with ketchup,chutney or sauce. Please also check other interesting "Chaats Recipes " for your evening snacks. Enjoy the healthy and easy recipe for making Menthya Hittu. You can find below the recipe on how to make MenthyadaHittu Pudi. It is known as Methkoot in Marathi. Dry roast all ingredients separately. Once cool, grind it into fine powder. Store it in airtight container. You can mix Menthyahittu with white rice, add ghee and enjoy. You can make gojju using this powder. Coriander Leaves thokku or Kothambiri thokku is a spicy and tangy accompaniment for your paratha and chapatis. Healthy and tasty and easy to prepare. Clean and wash the coriander leaves well and chop them finely. Pick only leaves. Next in a kadai, add oil and fry chilies,tamarind and leaves for 2-3 mins. Once done grind it well. In a kadai, add oil, add mustard and hing, once done add the ground paste and saute well for 10-15mins. Let it cool and you can store it in the refrigerator for a week. Enjoy this tangy thokku with parathas, chapatis or rasam rice. 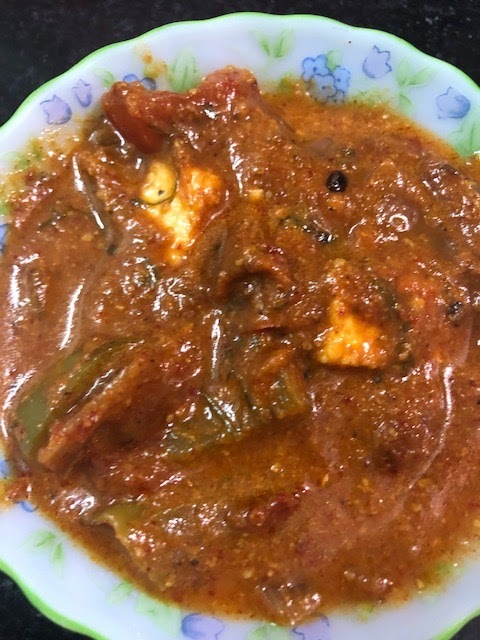 Please do check other interesting accompaniment for Indian Breads under "South Indian Side Dishes"
Tomato Thokku is tangy spicy made from ripe tomatoes. You can store it for a week. Enjoy it with breads, chapatis or parathas. Method- In a kadai, heat oil and add the mustard and menthya or fenugreek seeds and roast well. Do not burn. Grind it into powder. Next in the kadai, heat oil add chopped tomatoes,fry for 2-3 mins.Next add the tamarind, turmeric and keep stirring. Add water and let it cook on low flame till the tomatoes become very soft and water evaporates. Mash it well,add the roasted powder, jaggery,chili powder and salt and mix well. Prepare seasoning ,heat oil add the mustard seeds, hing,curry leaves, once it is done add it to the thokku.You can now enjoy it with dosa, chapati , idli or bread. Store it in airtight container. Do check other recipes made from "Tomato " under Ingredients search.